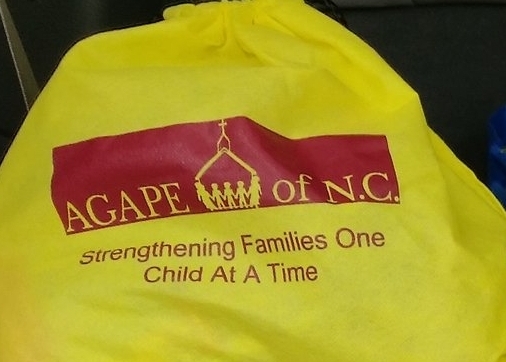 Backpack Blessings — AGAPE of N.C.
Beth became one of AGAPE of NC’s volunteer backpack distributors in late April 2017. She made her initial delivery of our first response backpacks, filled with a few essentials and expressions of love, to the Wake County Department of Social Services last May. In early June, Beth decided she wanted to do more and volunteered to help with recruiting backpack distributors to other NC counties and coordinating the collection of donations. Once AGAPE launched its summer backpack donation drive, I worked closely with their staff, learning as I went. It was emotionally overwhelming to experience the generosity of brothers and sisters in Christ as I stood on my long, deep front porch “unwrapping” boxes and bags full of donations from all over the state — then sorting and preparing the items to be re-packed into our AGAPE first response backpacks. AGAPE requested and received small stuffed animals, coloring/activity books, toothbrushes, toothpaste, washcloths, tissues, blankets, and notecards for children entering the foster care system. From the collection of some items to the sending notes of encouragement, it was apparent that children had also participated in many ways. As August came to an end, six ladies from the Raleigh Church of Christ joined me and an AGAPE staff member for our first backpack “pack party,” which resulted in 190 backpacks being assembled! We have received monetary donations this Fall to purchase more items and our backpack inventory continues to grow with newly donated items. So, we will be holding another pack party soon. Gifts to AGAPE’s backpack ministry are truly a blessing to the children who receive them. And it has been a blessing for me to serve with AGAPE of NC again. As I think about what has happened the last 6 months, I sit in awe of Him even more today than yesterday, knowing He orchestrated it all. Note: AGAPE thanks the members of the following churches who donated during our backpack donation drive this past summer and since: Biltmore Church of Christ (Asheville, NC); Cary Church of Christ (Cary, NC); Concord Church of Christ (Concord, NC); Deep River Church of Christ (High Point, NC); Hickory Church of Christ (Hickory, NC); Lexington Church of Christ (Lexington, NC); and Brooks Avenue Church of Christ, Lifepointe Church, North Raleigh Church of Christ, and Raleigh Church of Christ (Raleigh, NC). AGAPE expresses appreciation to individual church leaders, AGAPE staff, and volunteers who coordinated the collection, storage, and delivery for our Backpack Ministry!